The Bugatti Group is proud to announce that the Céline Dion Collection is now available in Asia on the largest business-to-consumer (B2C) online retail platform with Alibaba Group that owns Tmall.com, The Bugatti Group is opening the global market in distributing its flagship collections of Céline Dion Collection which are worn and loved by women all over the world. Our collections such as Adagio, Minuet, Libretto and most importantly an exclusive leather collection called Harmonic especially designed for the Tmall launch which reflects what the Céline Dion Collection is all about; effortlessly chic with a touch of greatness! Tmall.com is the largest business-to-consumer platform for local Chinese and international businesses to sell brands to consumers in mainland China, Hong Kong, Macau and Taiwan. Being one of the world’s biggest e-commerce websites, it has over 500 million monthly active users. The Arab Fashion Council (AFC), representing the 22 Arabic countries‘members of the Arab League announces today a multi-year partnership with the British Fashion Council (BFC). 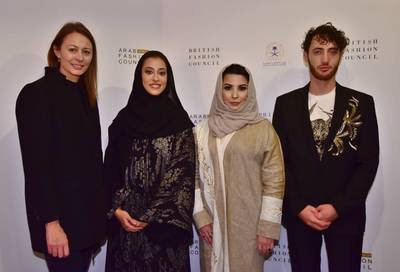 This partnership, which will see the BFC become a Strategic Development Partner of the Arab Fashion Council has two main aims; to deliver a growth strategy for the fashion industry within the Arab World and to provide a gateway in to the region for British and international brands without a foothold there currently. As part of the Council’s regional expansion, in December 2017, the AFC announced the opening of its regional office in Riyadh and the appointment of H.H. Princess Noura Bint Faisal Al Saud as Honorary President. Equinox, the high-performance lifestyle leader, today unveiled an unprecedented new take on its acclaimed “Commit To Something” campaign with “Commitment, A Collection by Equinox,” featuring seven one-of-a-kind luxury goods inspired by the passion and persistence of some of the most committed people and organizations on earth. In an on-demand world where everything is a swipe away and anything can be bought if the price is right, Commitment, A Collection by Equinox was conceived to subvert our typical perceptions of luxury. From “The Truth Lipstick” to “Eau de Blood, Sweat and Tears,” each product serves as beautiful proof of commitment in a noncommittal world. The catch? Nothing is for sale. Designed by some of the world’s most provocative fashion forces including Off-White’s Virgil Abloh, Shayne Oliver, Y/Project and Eckhaus Latta, the products explore the real-life stories behind The Washington Post’s truth-seeking journalists, the gay civil rights pioneers of The Stonewall Inn, marathoner/activist Kathrine Switzer, and other fiercely committed people and organizations. Commitment, A Collection by Equinox, developed in collaboration with Wieden+Kennedy New York, is further brought to life with Steven Klein-shot imagery that serves as an homage to classic luxury fashion advertising and an “e-commerce” hub, www.commitmentcollection.com, featuring interactive narratives on each product. Commitment, A Collection by Equinox is not for sale. Throughout 2018, several of the items from the collection will be auctioned off, with proceeds donated to nonprofit organizations of importance to the people and organizations behind each, including Equinox’s longtime charitable partners, Memorial Sloan Kettering Cancer Center and The Heroes Project. In some cases, donations have been made to these organizations on Equinox’s behalf. The Truth Lipstick: Made from blank newspaper pages from The Washington Post. Symbolizes the organization’s commitment to free press and journalistic integrity. Lipstick Case designed by Mel Ottenberg. The Law Suit: Designed by Eckhaus Latta, and made from case files of lawyer James Thornton, founder of nonprofit ClientEarth who, over four decades, has committed to fighting for the environment because it can’t fight for itself. Symbolizes Thornton’s commitment to solving the greatest challenges faced by our planet. Stonewall Stilettos: Designed by Shayne Oliver, and made from the actual pleather from the banquettes at The Stonewall Inn. Symbolizes the commitment of early activists fighting for LGBTQA rights. The Shades of Humanity: Designed by Adam Selman, and made from the camera lens of 2016 Instagram photographer of the year, Ruddy Roye. Symbolizes Ruddy Roye’s commitment to capturing the stories that often go unseen. Eau De Blood, Sweat & Tears: Bottle designed by Rafael de Cardenas/Architecture at Large with a custom scent by 12.29, the fragrance was infused with the actual DNA of Kathrine Switzer, the first woman to run the Boston Marathon. Symbolizes Switzer’s commitment to equal rights for all female athletes. The Scrubs Sweatsuit: Designed by Off-White’s Virgil Abloh, and made from the workwear of dedicated oncologists like those at Memorial Sloan Kettering, who patient by patient, are committed to fighting the war on cancer daily. Beginning on January 2, Commitment, A Collection by Equinox will also appear on Equinox social channels featuring stories behind each of the products and using the hashtag #committosomething. The products will also be displayed in select Equinox club windows nationwide as a nod to luxury retail shop displays. Equinox operates 92 upscale, full-service clubs in New York, Los Angeles, San Francisco, Miami, Chicago, Boston, Dallas, Houston, and Washington, DC, as well as international locations in London, Toronto, and Vancouver. The company offers an integrated selection of Equinox-branded programs, services and products, including strength and cardio training, studio classes, personal training, spa services and products, apparel and food/juice bars. Launching in 2019, Equinox Hotels will cater exclusively to the high-performance traveler to serve as the ultimate hotel destination with a 360-degree lifestyle experience. For more than 25 years, Equinox has consistently offered bespoke experiences and unparalleled services to consumers, developing a lifestyle brand that represents service, value, quality, expertise, innovation, attention to detail, market leadership and results.